One of my favorite family photo session to capture is a cake smash. 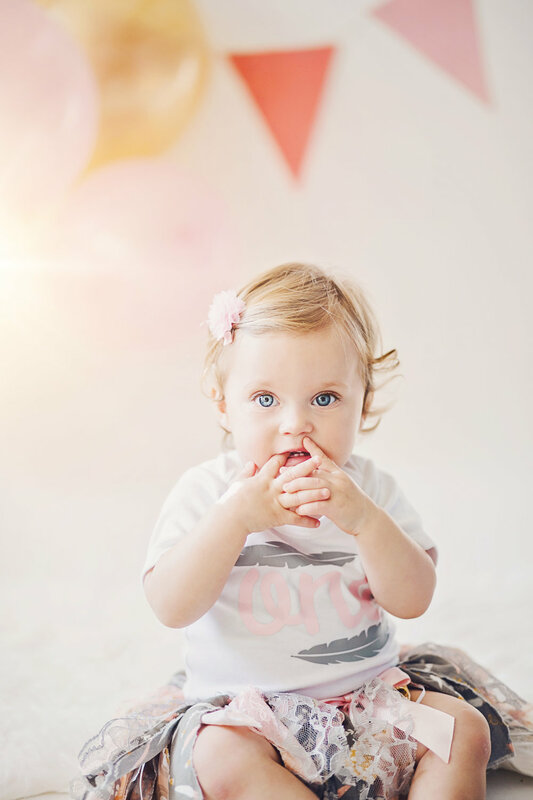 Depending on the clients wants, it usually starts with a baby’s 1st birthday. It’s an exciting time with the baby being able to sit upright by themselves, sometimes standing and supporting themselves, and getting to wear little human outfits. I set up either a mini pop up studio or we set up in an outdoor location. Then we decorate with balloons and tassels to match the cake. Most babies actually do not want to eat the cake and have no idea why they are sitting next to one. In order to make it look the baby is eating the cake sometimes I put snacks such as cheerios in the frosting so the baby gets encouraged and motivated to start digging into it. Then after lots of laughs and baby’s first sugar rush we take more shots with messy colorful frosting and big smiles. One is such a fun age to capture in photographs because they start laughing smiling, and really showing off their personality. Cake smashes are the perfect way to celebrate a birthday memory and the precious moments of a quickly growing baby. Let me know if you have any questions about scheduling a cake smash session!